Zoe and Josh of Ohana Winery and Exotic Fruit Farm are the poster children for how a quarter-life crisis can be the greatest thing to happen to you! 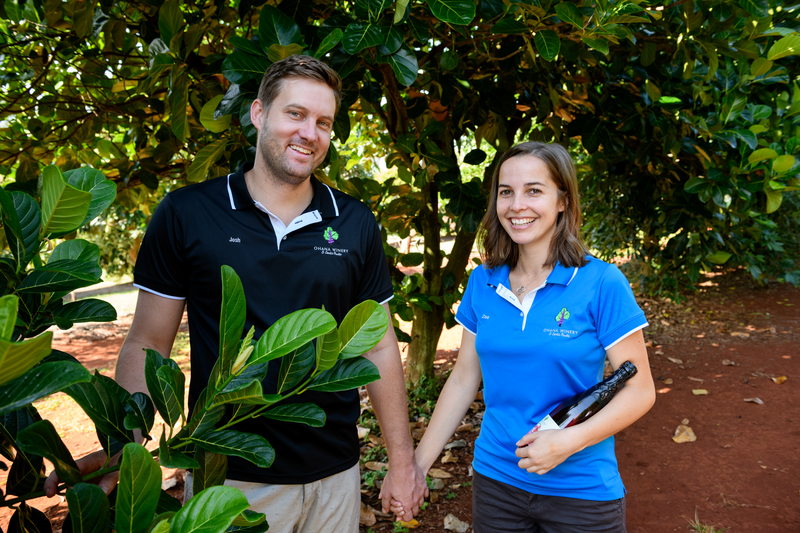 Dedicated office professionals in their 20s, the Perth couple had plenty of experience in wine drinking but no background in agriculture or winemaking. After a month-long holiday to Hawaii, they decided to pursue a life away from a desk and put the plans in motion to move to sunny Queensland and start their own business. Facing insurmountable logistical challenges in grape wine production, the entrepreneurial pair adapted a Hawaiian pineapple wine recipe with the support of a local pineapple farmer and their business took off from there. Their eleven-acre red soil property now hosts a highly varied tropical fruit orchard, which is supported by the perfectly imperfect 'second grade' fruit from local farms, so not only are you supporting a boutique winery, you're helping to support local farms by giving them an alternative outlet for their otherwise 'unsellable' fruit. Fruit winemaking must adapt to each fruit as well as to each crop. With mangoes, for example, Zoe and Josh hand peel each mango first as the skin leaves a bitter "green" taste if you leave it on. Pineapples are hand cut before being crushed, following which the fresh juice is adjusted based on the nature of that year's crop to ensure the correct acid and pH balance for a clean fermentation. After the fermentation is finished, the wines are aged, filtered and bottled, the same as a grape wine. This winery with a difference today boasts a hand-crafted, small batch range that has expanded to include Queensland apple cider, fruit wines and quirky liqueurs, the cellar door is a must-do in any visitor's itinerary. Where Can I See Ohana Winery this Winterfeast? Come make your own strawberry wine at the all-day, all-inclusive 'Winemaker For A Day', taking home a bottle of your own handmade strawberry wine. Where Can I Buy/Try Ohana Winery Drinks? Josh & Zoe's wines are available exclusively at their cellar door or online. Their ciders are available all over the Bundaberg region including Riverfeast, Indulge, The Spotted Dog Tavern, East End Hotel Bottleshop, The Club Hotel, The Rock Bar & Grill and Lana's Farmers Market.